These books are part of our Pastor, Derek Overstreet’s, personal library and are his top ten picks for growing in your pursuit of knowing and loving Christ more this year and every year! “Never lay it aside. Never move on,” says C.J. Mahaney about the gospel truth. Keeping the starting point of the Christian life the main point is critical to living the Christian life. C.J shows you the key to gospel joy and the safeguards against joy-stealing legalism, condemnation, and emotion-driven faith. Written in the final period of a man’s life known for his profound understanding of and fierce hatred for indwelling sin, John Owen focuses your attention on the heart of the gospel, Jesus Christ, with theological precision and profound devotion. Do you struggle to understand the difference between your role and God’s role in your Christian growth? If you do, first, join the club. Second, read this book. With biblical precision and grace motivated instruction, Jerry Bridges shows you how to passionately pursue holiness while fully resting in the all-sufficient person and work of Christ. In this classic study of the atonement, Stott takes you below the surface of the cross. From the heart of Calvary to the pervasive influence of the cross in the Christian life, His gospel insights combined with his scholarly gifting will lead both your mind and heart into worshipful communion with your Savior. Few songs communicate the gospel with such clarity and power as the great hymn, Amazing Grace. 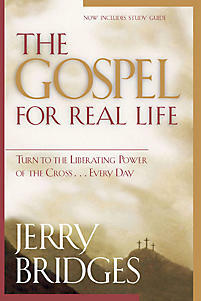 In the same way, few biographies demonstrate the transforming power of the gospel in a sinners life as this one. A riveting account of Newton’s life, this book celebrates the life of a truly wretched slave-trader whose life was transformed by and lived for a truly great Savior. The Christian faith is a faith that is meant to grow. From the moment you are justified to the day God brings you home, His desire for you is that you would grow in your knowledge of and love for Jesus. Knowing Christ more and more is at the heart of the Christian life. This book does just that as it takes you through a series of bible studies on the nature of Christ’s person and the wonder of his gospel work. No matter how long you have been a Christian, immersing yourself daily in the gospel is critical to following Jesus. Without flinching from the hard realities of sin, this book shows you the liberating power of the gospel that is for everyday real life. Do you turn your duties before Christ into your peace with Christ? Are you more aware of your sanctification than your justification? Does it seem like your sins are greater than Christ’s righteousness? This seventeenth-century tract (all 28 pages) will lead you to the sweet place of Christ being your all-in-all. Few things focus our hearts and minds on Christ like studying the wisdom of God in salvation. In this book, you will expose yourself to the scholarly and systematic teachings of the ordo salutis (order of salvation). From God’s election to the nature of saving faith to the perseverance of true believers, reading this book will produce sweet communion with your Savior. Do you want to be overwhelmed by the love of God in the gospel daily? If so, read this book. In his book, Milton Vincent not only articulates the gospel faithfully and clearly, with relevance and skill, he unpacks the daily implications of Christ’s work on the cross through short meditations that will bring lasting delight into your Christian walk.